Travelling into Peel on the main road from Douglas turn left at the crossroads into Queens Drive. At the roundabout turn right and continue down Queens Drive. At the bottom turn right at the junction then left down Station Hill and then right at the traffic lights past The Creek Inn. Harbour View will be found a short distance along on the right hand side. Remotely operated gated access leading to courtyard and car park. Coded access. Personal mail box. Electronic key pad entry to apartment. Video entry control system. Solid oak skirting, architraves and doors throughout. Fitted with a good range of shaker style cream fronted wall base and drawer units incorporating integrated dishwasher, washer/dryer, built-in microwave and oven. Under pelmet lighting. Exposed beams. Downlighting. Entrance hall with built-in storage cupboard housing the Mega Flow system water tank. Door to Bedroom. Door to En-Suite Shower Room. Open beamed ceiling. Built-in wardrobes. Downlighting. Views over the harbour, hill and surrounding area. Fitted with a white suite comprising corner shower cubicle, modern wall mounted wash hand basin with Illuminated mirror over and low flush WC. Fully tiled. Downlighting. Chrome heated towel rail. Hallway with double built-in wardrobe. Door to Bedroom. Door to En-Suite Bathroom. Built-in wardrobe with hanging rail. Overlooking rear elevation. Fully tiled to compliment the white suite of Bath with shower over and screen, wash hand basin with mixer tap inset a modern vanity unit with illuminated mirror over and a low flush WC. Chrome heated towel rail. Secure under cover parking Space. Services – All mains services are connected. Gas fired central heating. 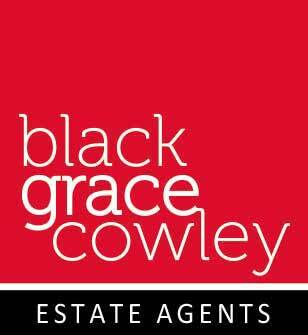 Viewings by appointment, through the Agent, Black Grace Cowley. 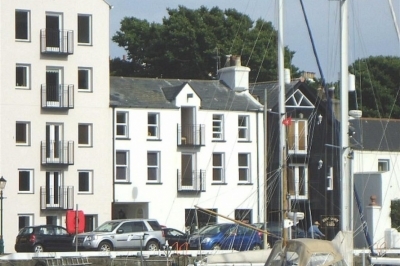 A Superb second floor apartment in a unique development situated on the edge of Peel's harbour with stunning views over the Marina and out to Peel Hill. This stylish apartment with quality fittings throughout provides quality accommodation ideally suited as either a permanent home or a lock up and leave summer home. The accommodation comprises Lounge, Kitchen, two Double Bedrooms, (both En-Suite). Secure Parking space. Harbour Views. No Forward Chain.